a few minutes ago, we were watching the delayed telecast of the today show on 2nd avenue when they showed the "live" announcement of the golden globe nominees. 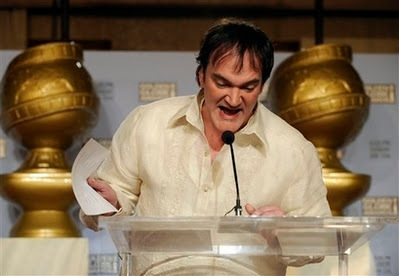 and there was quentin tarantino, mukhang bagong gising, in the podium announcing the nominees for best drama. when we realized, hey, he's wearing a barong tagalog! that must be the barong tagalog he wore to his visit to malacañang when he got caught in a flash flood that caused a monster traffic jam so he had to wade through waters to take a pedicab and ended up wetting his trousers so he had to change into someone's jogging pants last august. of course he looked a bit disheveled and unkempt and kooky. that's probably what prompted defamer to express shock at his "less-than-tidy appearance," showing up with a "distressing combination of uncombed hair and decidedly casual, girth-obscuring shirt." granted, the shirt was not ironed and he was not wearing it properly, but hoy! educate yourselves! in the philippines, the barong tagalog is considered FORMAL WEAR. this is the problem with some of these bloggers: they're just too lazy to do their fact-checking and research. or they're just smart asses. quentin is so kooky and fun haha! Yeah, smart asses! Hindi nga lang bloggers… some magazines (cough) are getting lazy na rin. Yaknownawho. Quentin scored a boatload of points with me for wearing the barong! Standing O! I'm still not a fan of his movies, but Quentin—we salute ya! I caught this on tv as well. 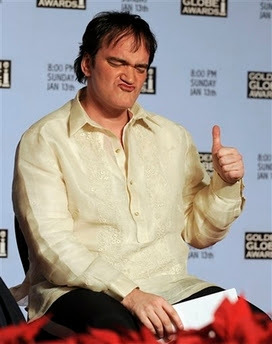 I thought I was just imagining things but I looked closely and true enough Quentin was wearing a barong. Medyo hindi na-plantsa but then again the barong isnt the easiest thing to iron. I would know. Buwisit nga yung ibang bloggers diyan na di muna mag-research. hmph! The novel sartorial appearance generated equivocal comments. The LA crowd, seeing the "Barong" for the first time, thought the director looked too casual in his "tie-less" get-up. 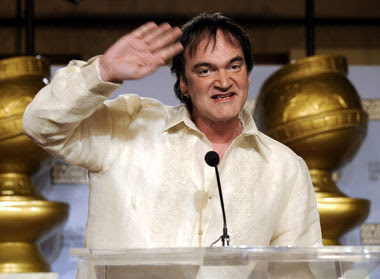 While Pinoys world-wide applauded Quentin for giving their native dress international exposure. According to www.tesoros.ph Quentin was gifted with a 'TESORO'S" barong by the National Commission of Culture and the Arts Executive Director Cecilia Guidote-Alvarez and by the Film Development Council of the Philippines vice-Chair Christine Dayrit. The Director was presented the 24 hour executed, custom-made barong for his courtesy call to the Philippine President Gloria Macapagal-Arroyo. The Barong Tagalog is the recommended attire when visiting the Philippine head of state. Most delegates are automatically gifted by their Filipino hosts with one. And their store of choice is Tesoro's which carries the widest assortment of barongs, with a price to suit every budget and a style to suit every taste. Tesoro's must have done such a good job as Quentin saw it fit to wear the barong again and in front of an international media event at that. Quentin's patronage of the barong will endear him in the hearts of the movie going Pinoy (Filipino) public for many years to come.